Although the concept of blockchain is most likely to be associated in many people’s minds with cryptocurrencies such as Bitcoin, it is not just another word for Bitcoin — it is a fundamental, underlying system that can be used in sectors far beyond cryptocurrency. This emerging technology has huge potential when put to work in a variety of other applications, including renewable energy, grid management and energy storage, smart contracts, and more. But how will the implementation of this technology impact the sectors of clean energy, electric vehicles, and other cleantech in the days to come? 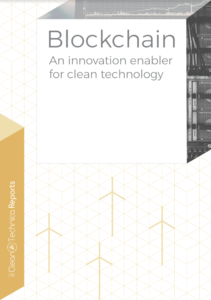 In CleanTechnica’s latest in-depth report, Blockchain: An innovation enabler for clean technology, Michael Barnard takes a deep dive into blockchain’s potential as a cleantech innovation catalyst. “Blockchain is a new foundational building block for doing business on the internet. In its various forms, it allows fully anonymous transactions and regulatory ready transactions, fully distributed solutions that radically change value streams to better centralized solutions and more. Beginning with the very basics of blockchain, Barnard notes that it is “an accounting system at heart,” a way of recording transactions. “It keeps track of transactions, just like a list of purchases in a spreadsheet.” The report, Blockchain: An innovation enabler for clean technology, then explains the structure and systems that form the underpinnings of blockchain technology, as well as the distributed nature of the ledger. The report also digs into the more widely known application of blockchain — cryptocurrencies — and examines ways to fund cleantech programs with these emerging alternatives, from ICOs to carbon offset tokens, and then covers 10 of the major blockchain technologies along with an evaluation of their relative strengths and weaknesses. “Blockchain and cryptocurrencies for cleantech are a rapidly evolving space. This is a snapshot of a moment in time. It’s safe to say that cleantech is going to involve blockchain and similar distributed ledger approaches. And it’s also safe to say that each of the technologies and approaches represented here have better and worse uses. If someone tells you that the answer is only one of these, then you can be pretty sure that they are enthusiasts, not architects. The report also includes a discussion of CleanTechnica readers’ opinions and sentiment on blockchain for cleantech, as revealed in a survey distributed to our core audience. No discussion of blockchain would be complete without some coverage of the dark side of blockchain, which is the high electricity consumption of bitcoin and other mined cryptocurrencies. The report also includes discussion of a few next-generation blockchain models that will have lower electricity costs and related carbon footprints. The last chapter of the report lays out an overview of global blockchain cleantech solutions, including those involving startups, established businesses, major utilities, and entrepreneurs. The report Blockchain: An innovation enabler for clean technology is available at https://products.cleantechnica.com/reports/.